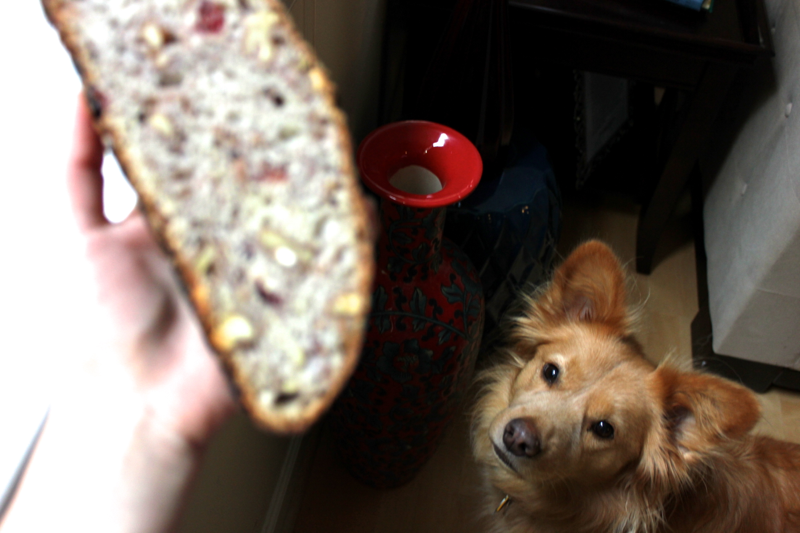 I’ve had a hankering for cranberry walnut bread since I ate a delicious slice out of Le Diplomate’s bread basket. My requests to buy a loaf were rejected, and I immediately began scheming up how to bake my own. But I never imagined that it would be this easy. Really, baking this utterly delicious and impressive loaf of bread required practically no work, other than exercising my patience muscle. But when it comes to eating this bread, I’ll gladly exercise my jaw. Because this bread requires an overnight rise, start preparing it the night before you plan on eating it. I started mixing my batch up around 9 PM. Begin by toasting 1 cup of walnut halves in the oven until they are lightly browned and fragrant. 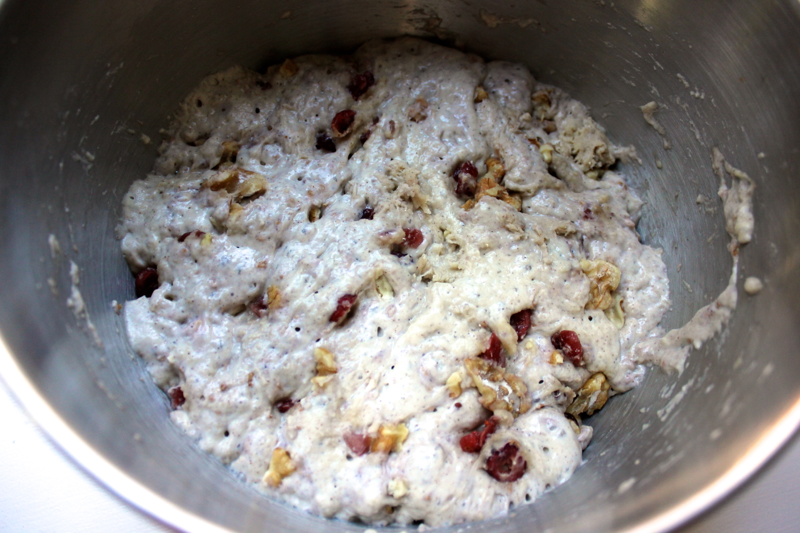 To a large bowl, add 3 cups of bread flour, the toasted walnuts, 1/2 cup of dried cranberries, 1.25 teaspoons of salt, 1 teaspoon of yeast, and 3/4 teaspoon of cinnamon. Don’t worry about the cinnamon- it provides only a subtle, but welcome, warmness. Mix the ingredients together so that they are evenly distributed, and then mix in 1.5 cups of slightly warm water. The dough should come together into a very sticky mass. That’s it! Leave the dough in the bowl, and cover it with plastic wrap. Set the bowl aside on the counter to rise overnight. The next morning, anywhere from 12 to 18 hours later, the dough should have risen a lot. Generously flour your counter and hands, and then scrape the dough out of the bowl in one piece. Use your hands to shape the dough into a ball by stretching the edges of the dough and tucking them in towards the center of the ball. Sprinkle a generous amount of flour over a kitchen towel, and place the dough in the center. Drape the corners of the towel over the dough, and then set it aside to rise for another hour or two. 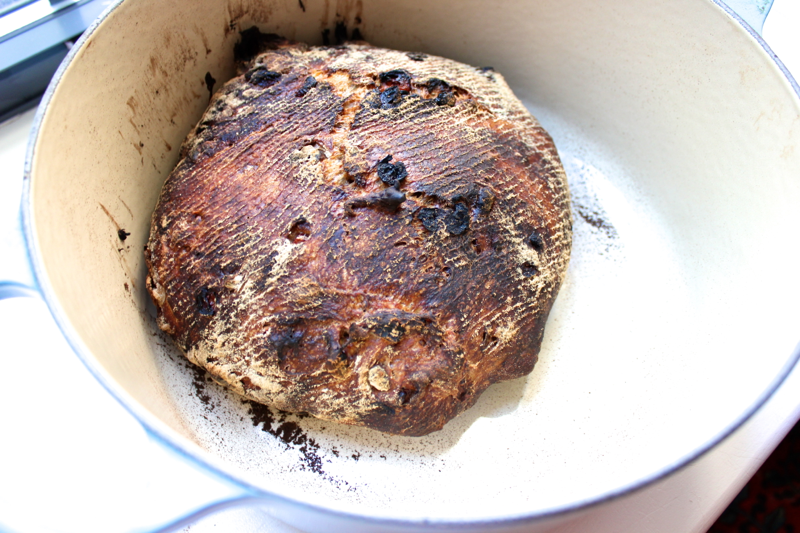 When the dough has almost doubled, put an oven-proof pot with a lid inside the oven. Pre-heat the oven and the pot to 475º F. When the oven reaches that temperature, remove the pot from the oven (using potholders, of course! 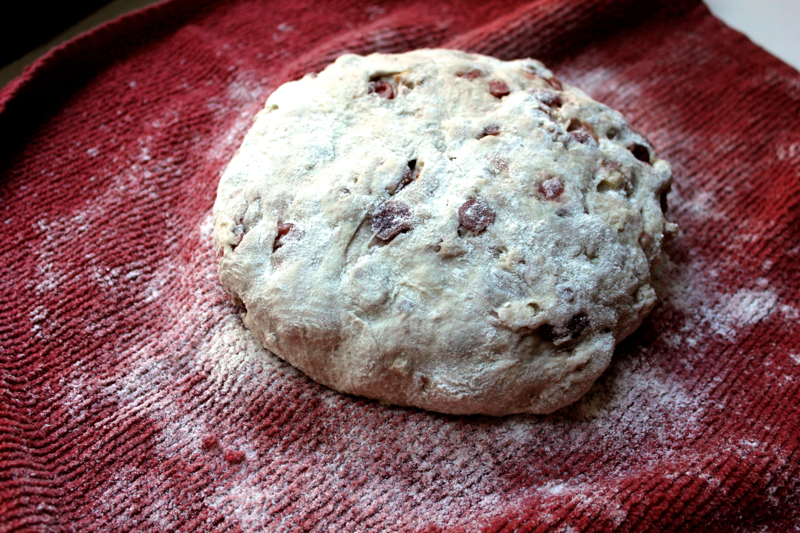 ), and use the towel to flip the dough into the pot. Cover the pot, and return it to the oven for 30 minutes. After that time, remove the lid from the pot. If your bread is toasty and golden brown, it’s done! If not, continue baking the bread without the lid for another 15-30 minutes until it reaches the toasty and golden brown stage. Use a spatula and your kitchen towel to lift the bread out of the pot, and set it on a rack to cool. As my loaf cooled, I could hear its crusty exterior crackling away! When the bread has cooled, slice into that baby! 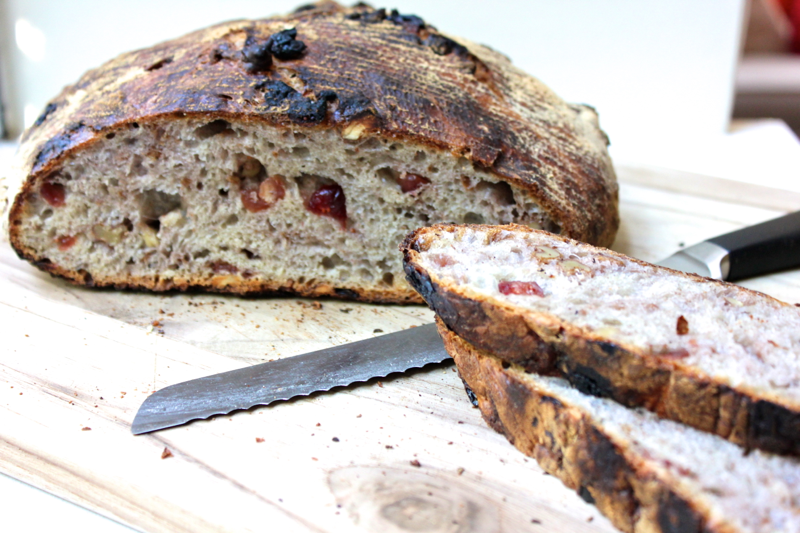 The golden, crusty outside gives way to a very soft and tender inner bread that is beautifully studded with shapely walnuts and jewel-toned cranberries. Even more than being beautiful, the bread is DELICIOUS! I like it toasted and spread with butter and apple butter. This bread is also delicious to eat on its own, but if you’re really excited about it, you could slice it thinly, return it to the oven to crisp up, and use it as crostini to eat cheese. Or you could toast some slices, cut them into spears, and use them to scoop up a soft boiled egg. Or, you could use it to sop up a bowl of squash or pumpkin soup. Or you could sneak a piece to a hungry pup…but I’m selfish and haven’t wanted to part with a single morsel. Sorry, Stella! 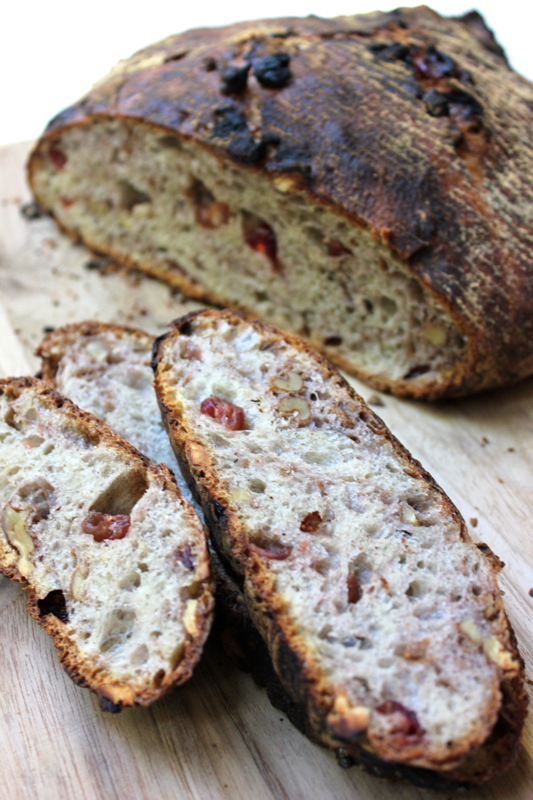 This recipe is adapted from Jim Leahy’s My Bread. I’m so hungry for that bread. I have a pot of pumpkin coffee brewing and oh! 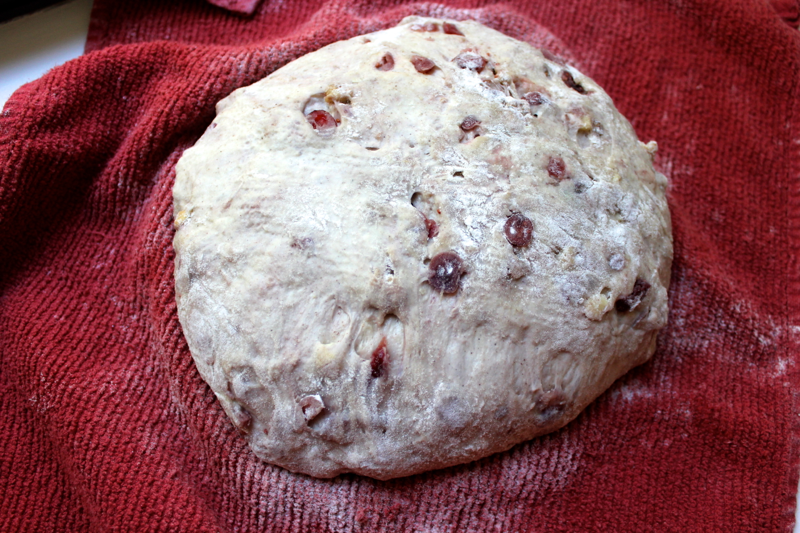 I wouldn’t substitute the dried cranberries with fresh cranberries because they may change the moisture content of the dough or be too sour. 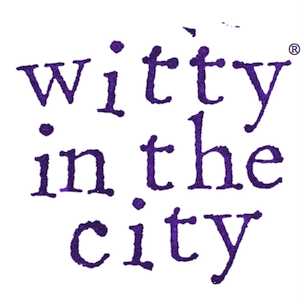 Pam it is Cara’s mother, Annemarie….love your blog! Cannot wait to try your version. I read every recipe you post and live reading your blog . I have a confession … Yours is the first blog … And only blog for that matter I follow . I am definitely making this bread . Be right back … I will tell you how it comes out ! What an honor! Thank you so much, and I hope your bread turns out as delicious as mine did! I tried this bread a few days ago, and it was the most delicious bread I have ever made. I will be making several loaves to give as Christmas gifts. Thanks for a great recipe. I am so glad you like it! I should make some to give away too, but I can’t keep myself from eating it! I haven’t tried it. The pot helps keep the temperature even and creates a humid environment. Baking on a cookie sheet might require a longer cook time, and I’d recommend lightly misting the bread with water from a spray bottle about half way through cooking. If you try it, let us know how it turns out! I went with some friends to D.C. for the march and we fell in love with this bread! Thank you so much for the recipe. 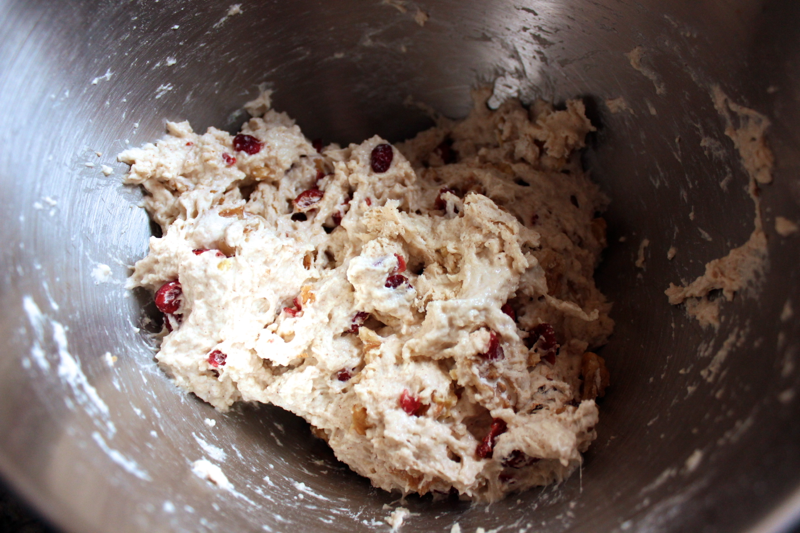 I make it with 1/2 white and 1/2 wheat flour, and I upped the cranberries to a full cup. Also, I’ve played around with it, subing pecans for walnuts and allspice for cinnamon. Delicious! 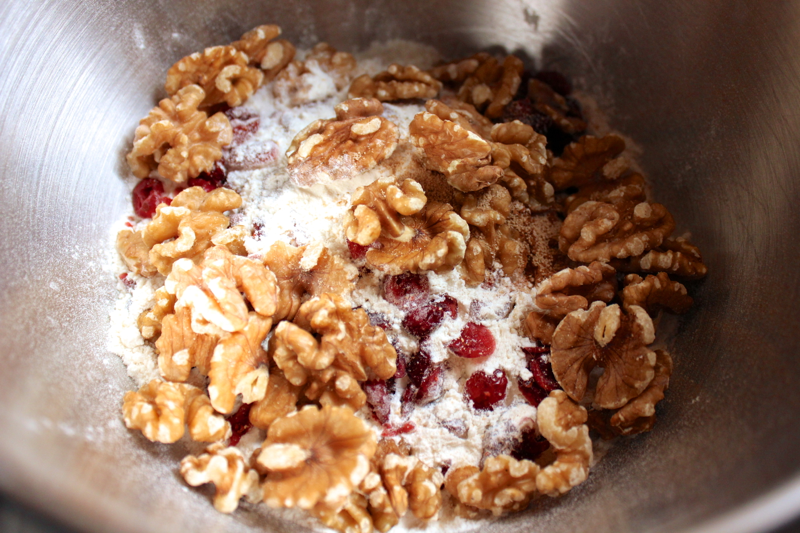 Also–when doubling the cranberries I lined the Dutch oven with parchment paper so they don’t stick to the pan. Thanks, Carrie! Its an amazing recipe!